I know I am a little obsessed with all things peanut butter, but I wanted to try and crack this heavenly ingredient as a healthy breakfast treat. I love peanut butter pancakes and muffins but I don’t like the guilt or the inches these delights put on my waistline if eaten every day. So I needed to find a healthier way to enjoy it and I think I’ve cracked it! 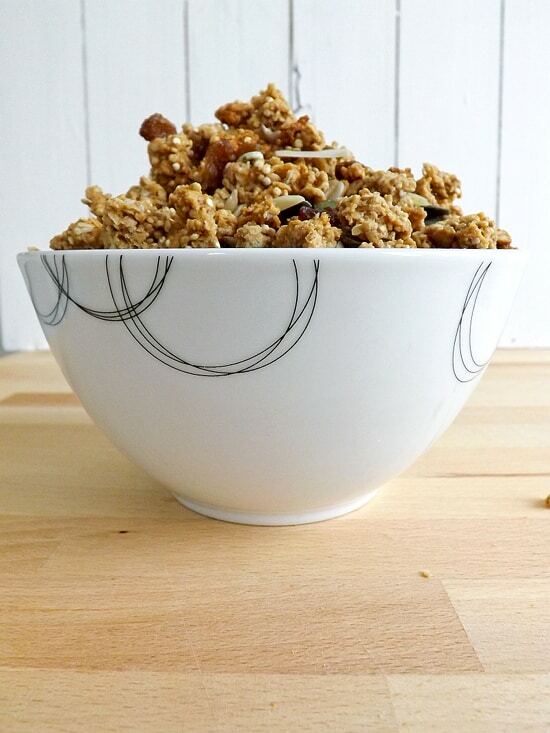 Homemade granola is really easy to make and takes very few ingredients to make a basic one. 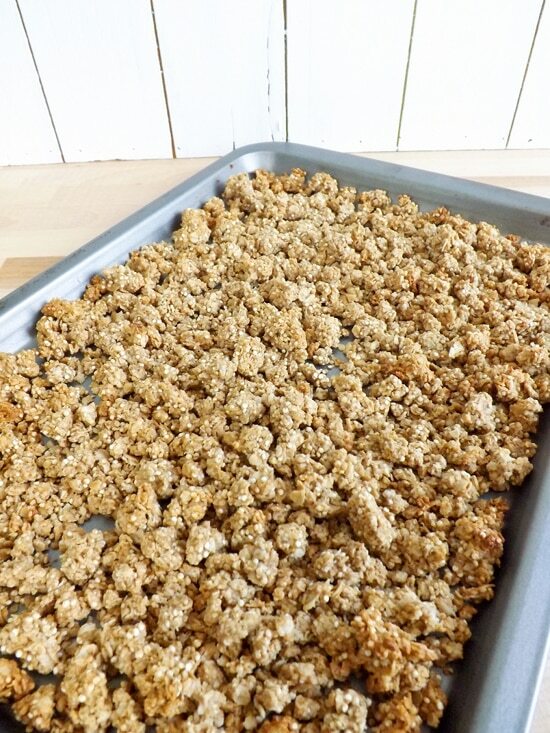 You just need some rolled oats, a liquid sugar (I use honey and it makes a great binding agent) and that really is about if for your most basic granola. But who wants plain old granola? 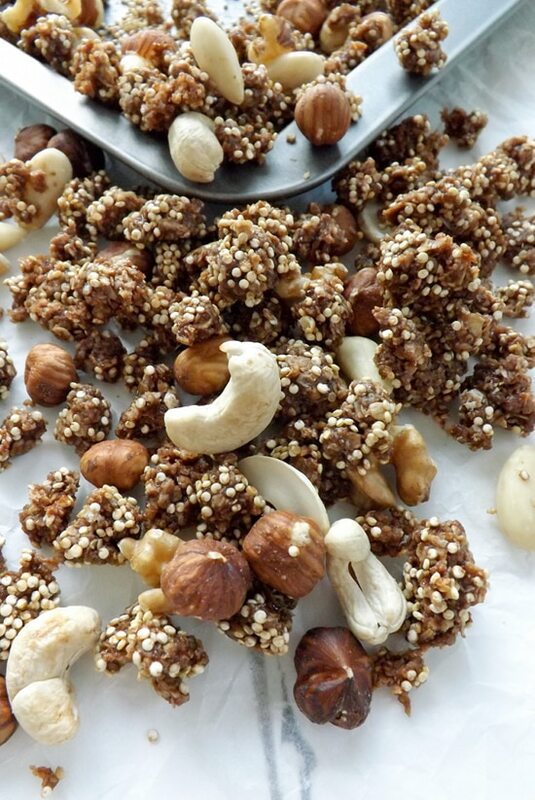 You can use any add-ins you fancy like dried fruits and nuts. I have tried this recipe so many times to bring you the best one and this one is definitely it. The peanut butter is strong enough to be enjoyed but not over powering, like some of the other times I have made this. It is just the right amount. 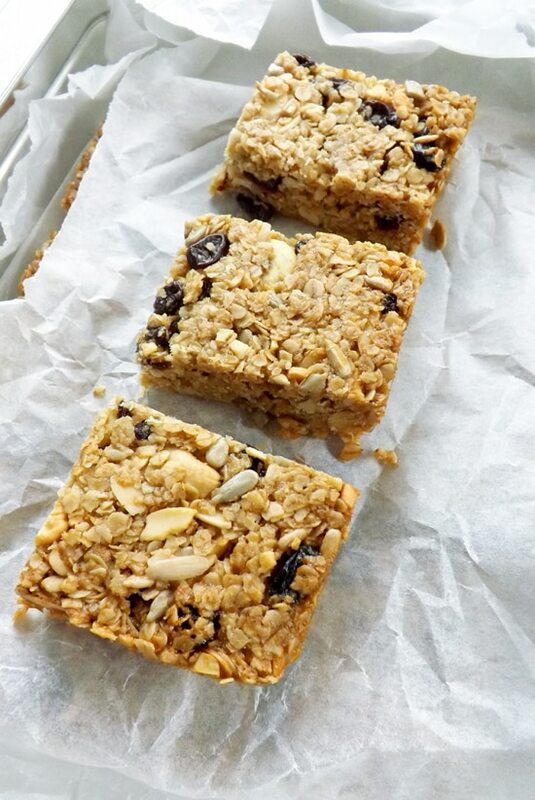 I added some flaked almonds as well as they are good for helping to lower cholesterol as they are packed full of healthy fats and vitamin E. I also added some sultanas mainly because they taste great but they too are packed full of protein and fibre. You could add what you like but this is a great combination and everything compliments each other really well. 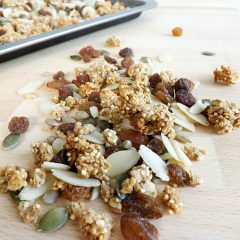 A crunchy homemade granola flavoured with peanut butter and packed full of healthy add-ins like quinoa, pumpkin seeds, flaked almonds, sultanas and sunflower seeds. Preheat your oven to 160C / 325F / Gas mark 3 and get a medium size baking tray to hand. 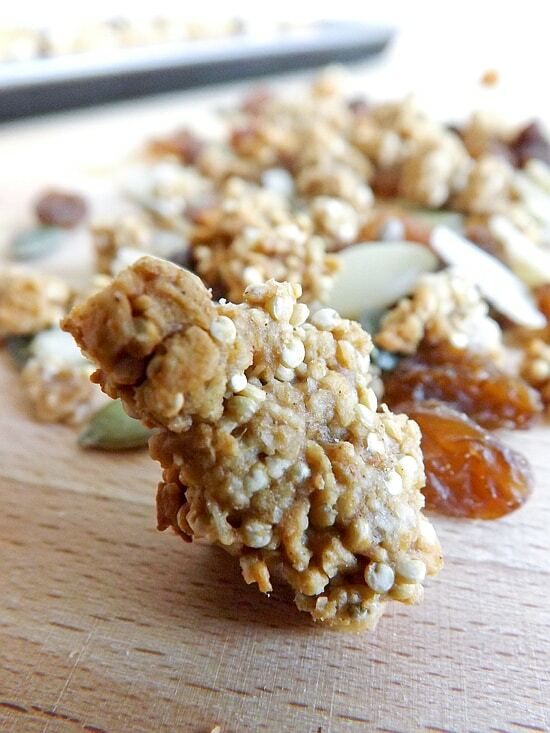 Measure out your oats and quinoa and place to one side. Put your peanut butter and honey in a microwavable bowl and heat on a medium heat for 30 seconds. Take it out and give it a good stir, it should have liquefied the peanut butter. Add the ground cinnamon and vanilla extract and mix in well. Pour in the oats and quinoa and stir until everything is well covered, then sprinkle on a baking tray and pop in the oven for 10 minutes. 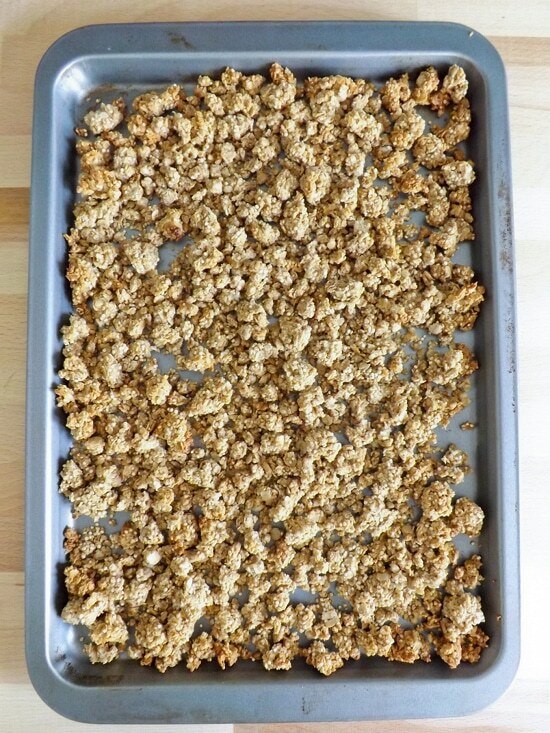 After 10 minutes give your granola a stir then pop it back in the oven for another 10 minutes. 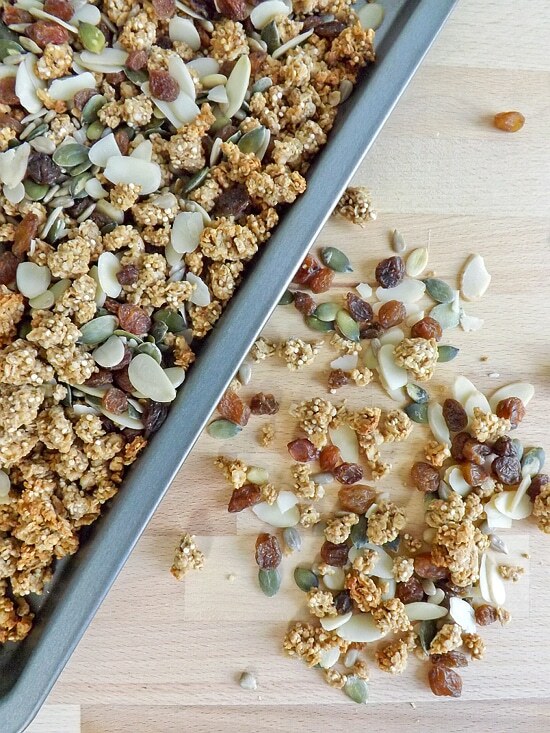 While your granola is baking weigh / measure out the rest of your ingredients. 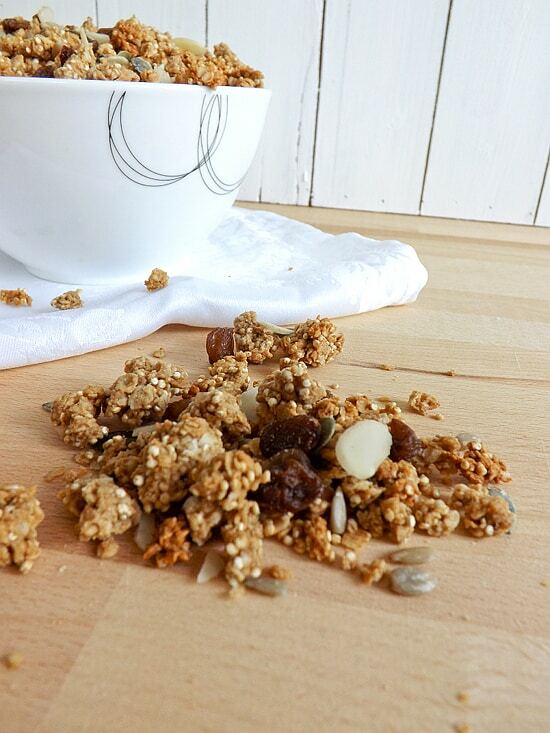 The sultanas, pumpkin seeds, sunflower seeds and flaked almonds and leave to one side. 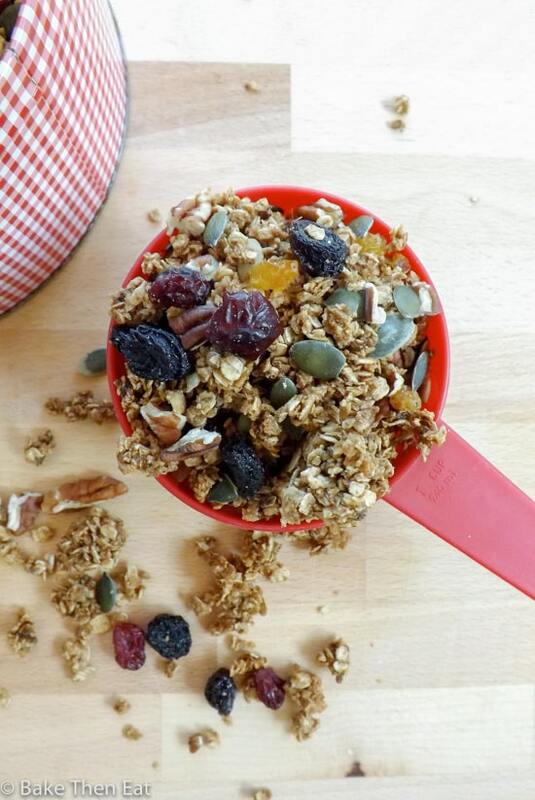 Once the baking time is up, take your granola out of the oven and allow it to cool, this will allow the granola to crisp up. If there are any large clumps gently break them up to a more manageable size. 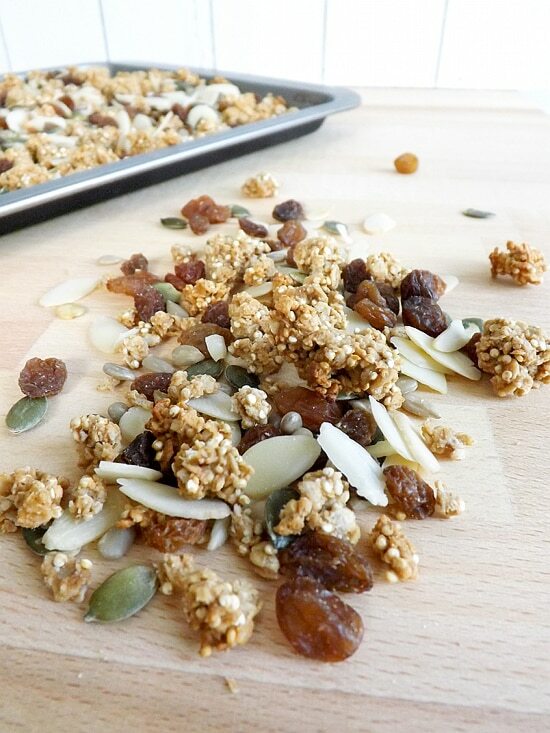 Sprinkle the rest of your ingredients on top of the granola and gently mix in. 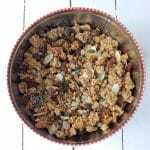 This granola will keep for up to two weeks in an airtight container. Serve with yogurt, fresh fruit or even just with milk. This looks like a perfect starter to any day! 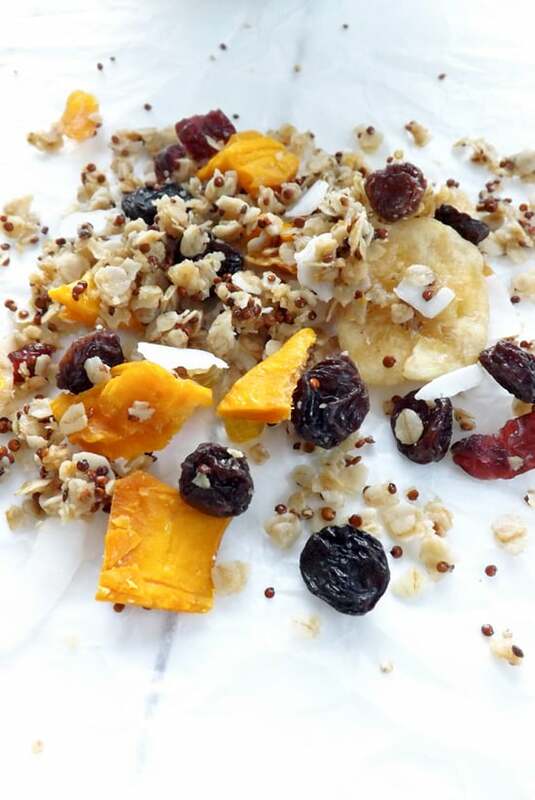 Great idea to add quinoa…I’m sure this granola is healthier than anything found in a store, and it sounds much easier than expected! I love that you put some healthy quinoa in there – I’d love this right now. 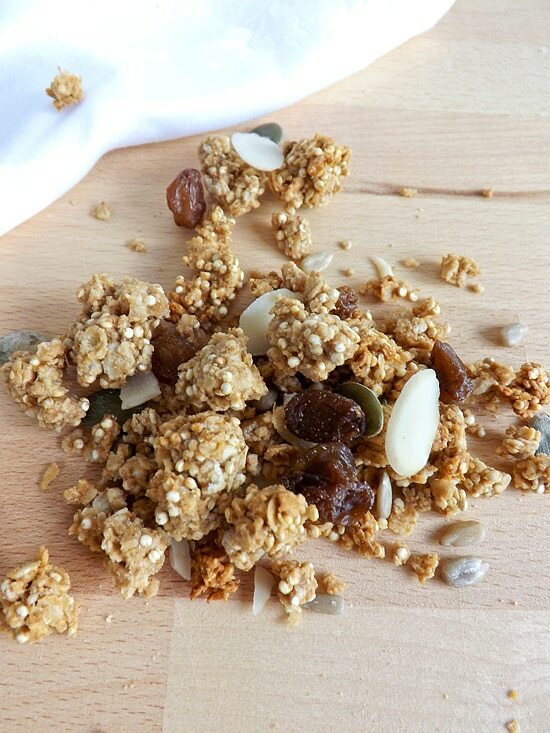 Whoa, your granola sounds amazing…perfect little nibbles mixed with fruit and nuts!